"Rent-It is a family owned truck rental company formed in 1980 with the goal of providing our customers, both Commercial Truck Rentals and Individual Rental Trucks, with the best trucks on the road and unsurpassed service. Starting with one location in Canoga Park which gave way to our expanded facilities in Chatsworth, Rent-It Truck Rentals quickly grew with offices opening in Simi Valley, Ventura, and Santa Clarita. 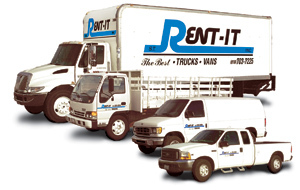 Rent-It Truck Rentals provides our customers with the best, top-maintained trucks on the road. Our maintenance program is the envy of the Rental Truck Industry. Our Rental Truck Specialists are here to provide unmatched service along with free advice for all your moving questions. Backed by a huge assortment of moving supplies including boxes, tape and packing materials, rental furniture pads, tie down and assorted dollies; Rent-It has everything you need for your move!" "Rent-It was formed with the philosophy that is reflected in our Mission Statement:"
"We are committed to having the BEST trucks, BEST service, and BEST value ….. Period." This Ribbon Cutting ceremony celebrated the opening of our new location in Chatsworth in 2010. It was attended by local business owners and Chamber of Commerce Committee members and representatives. Some of the members even showed up wearing Rent-It t-shirts! After the pictures were taken, Rent-It served lunch and refreshments to all. A big topic of discussion was how to grow local businesses and succeed. Being a member of the Chamber helps the local businesses help each other. We are grateful to be a part of such a fantastic and supportive community.